Buying a car of any kind is a tricky process, but purchasing a used car instead of a new car can be even more complicated. Instead of heading to a dealership, you’re browsing used car lots, the internet, and even the streets of your neighborhood to find the right car at the right price. It takes time and great effort to find the car of your dreams in good condition — and from a reputable seller. Instead of trying to master the used car buying process on your own, follow these dos and don’ts to ensure you get the best vehicle for you. Even if you’re buying a car from someone you know and trust, you should always get a vehicle history report for any used car you’re considering. This is one of the first steps you should take — you’ll want to see the report before you even go see the car. These reports reveal important information about the vehicle, like if it has a salvage title, rolled back odometer, has ever been in an accident, or comes with other issues. You’ll only need the car’s VIN to get started, and many online used car ads will post this information in the ad. 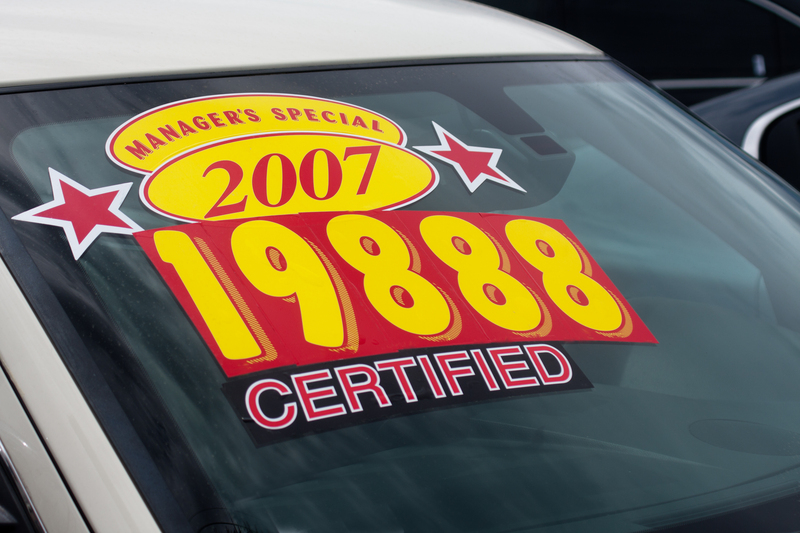 A certified used car sounds great — after all, it’s certified! However, this doesn’t mean a car is a great deal. Depending on the program or dealership, it might mean absolutely nothing. Many certified used car programs provide only a powertrain warranty with factory backing. Another commonly misleading used car program offered by dealerships is the Certified Program. These used cars are actually previous rental cars. The interior can be damaged and often, the cars have gone many miles between service intervals as they’re rented out repeatedly. A better approach is to look at cars that were originally sold at the same dealership where they’re currently being resold. This means the customer likely had a good experience buying from the dealership and further, the dealership may have service records for the car. The dealership may even know the customer well enough to answer questions about how the car was used. You can then determine whether the asking price is fair or if negotiations are needed based on the condition of the car. Whenever you’re ready to buy a car, you should have two distinct phases: shopping and buying. The shopping phase is where your research comes into play. Maybe you’ll go to a dealership to test-drive a two year-old car before looking for a private seller, or maybe you’ll compare prices for a desired car at multiple locations. Whatever you do, don’t be tempted to go into the office and start negotiating a price on the car you just drove. When you’re ready to buy, you want to be armed with all the research and information you need to get the best price. You won’t have that in the shopping phase, and dealers in particular will attempt to rope you into an impulse buy before you have all the information. When you’re finally out to see the car and everything else has checked out, you should always take the car for a test drive. However, there’s a right and wrong way to take a test drive. Ideally, you want to take the car both on a city street and on the freeway. Take note of how the car drives. Do you smell anything odd? Hear any squeaking or squealing or grinding? Does the car drive smoothly, or does it shake? Test controls like air conditioning, heaters, power windows, cruise control, wipers and anything else you can think of. You should also take a look under the hood to see if anything is amiss. While the car is running, also check the smoke from the tailpipe. If it’s black, white or tinged blue, you have problems. No matter who you’re buying a used car from, never take the vehicle to the seller’s recommended mechanic. Instead, insist on taking the car to a mechanic you know and trust. A pre-purchase inspection might run you around $100, but it’s worth it — this quick inspection can uncover serious problems that could make a used car a clunker instead of a great deal. A reputable seller or dealership shouldn’t have any problem with this; if they do, that’s a red flag all by itself. A good mechanic can find any number of costly problems, from worn engine parts, to frame damage to suspension issues. By doing due diligence in inspecting your potential used car and knowing facts, you can not only save money but also end up with a reliable car sure to last a long time.